“No matter what, each mighty role offers up a unique way to play. Puff up your power by crafting new weapons and spending materials at the shop to receive even MORE weapons, not to mention armor and items. Beyond the main game, there's also a ton of quests and a brand-new challenge system. Plus, tapping compatible amiibo™ figures/accessories will earn you extra fragments to help craft new gear! Are you ready? For Kirby, the answer is always fight and flight. To download this free game, tap the icon on your HOME Menu. A Nintendo Network ID is required. Let's talk about this “crafting”, because saying you can “craft” things is really in with the kids these days. You don't craft anything. There's a shop (Magolor's Shoppe) where you can purchase items by giving him shiny fragments and Gem Apples. You don't make the items out of anything. There's no mystery in terms of what you'll get, and there's no grinding for materials, either. You get way more fragments than you need, and you can't grind for Gem Apples — just buy them or wait (or earn them in a total limited amount). The only thing you can grind for is experience points, and if you want to do that, then check out my Team Kirby Clash Deluxe optimal tips and scoring spreadsheet here. I updated it with new tabs and scores, including a tab on my actual times for every boss, plus a list of the bosses’ experience-to-vigor in ascending order. Anyway, no crafting. That's not mentioned in the instruction manual or in-game. It's a marketing buzzword. “Spend” materials is correct, though. You don't receive weapons in any other way than through purchasing them in the Shoppe. Nintendo already made a trailer for the game (see above) and their verb was “buy”, so whomever writes the copy for the trailers and whomever writes the copy for the push notifications aren't talking to one another. 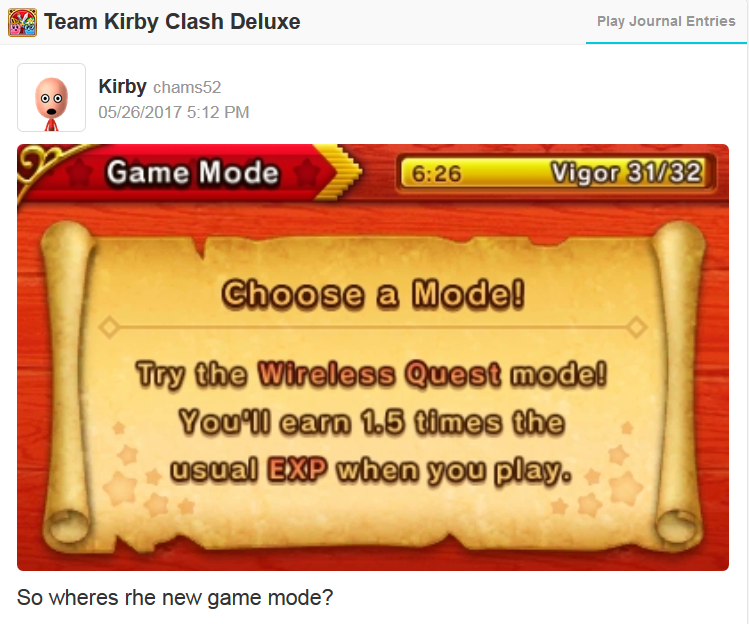 For Kirby, the answer is NOT always “fight and flight” because the wait-to-play vigor system means that you will spend a lot of time waiting for time to pass, instead of fighting. That's certainly not “always” fighting. The push notification image claims there is a “DEMO AVAILABLE”, but there is no demo. The whole game is pretty much a demo for a minigame in Kirby Planet Robobot that you can pay for. I wouldn't say the quests, also known as Heroic Missions, are “beyond the main game” because they sort of ARE the game, but let's give them that. Four quests per boss, though one of those is always “Defeat this boss!” There's also other Heroic Missions like “Reach Level 27.” or the impossible, “Try a wireless quest.” At least the music is nice in the wireless quest room. But what the hell is the “brand-new challenge system” supposed to be? Brand-new to what? What are they even talking about? The poor Miiverse kid thought it was some kind of update to the game. There's nothing called a “challenge system” in the game. The quests are challenging, sure, but they're not called a challenge system and the quests already got lip service in the sentence. Nintendo flat-out made a big feature up that does not exist and will not exist in the future. That's not good. SOMEONE'S gotta stand up to ‘em. This Miiverse user will forever be looking for where the new game mode is. Ludwig believes to have the highest score on Miiverse (and perhaps the world, but who knows?) in Team Kirby Clash Deluxe in single-player and without attack potions. It currently is at 114,975. Can you beat that? Ludwig believes that, because of his many hours of experience in Team Kirby Clash Deluxe, he is the best one positioned to evaluate Nintendo's marketing claims about the game. ...Huh. I can't account for this, what did they think they were doing? My honest belief here is that the copywriter had no idea what was in the game and had to come up with something. The parts of the copy that are true make it sound a lot better and cooler than they actually are in the game, so they might've just gotten carried away. There wasn't any online multiplayer thing though, was there? I thought it was local only. It's local only multiplayer, buuuut bthere's a "Wandering Adventurers" feature that lets you get three random people from the Internet as AI partners, with their stats/gear and a greeting. First, it gets people from your friends list who have the game. After all of those are exhausted, it gets people of a similar level to you. Each Kirby can be used in three battles, so if I use Rawk's Kirby in three matches, it disappears. Then if I do Wandering Adventurers again, I'll get it back with new stats if he's played it at all since. Well, to be fair, I basically have been at level 7, not 2, since a day or two after the game came out (to speak of duplicitous claims! ), and just for you, Ludwig, today I brought my Kirby up to level 9. But anyway, I don't think it's that fun having a bunch of real-life timers in my games, and RPGs are not a genre I am particularly fond of in the first place. Team Kirby Clash Deluxe does get skill-based in terms of the later fights (final boss and stuff), and then RNG-based when you're trying to get really high good scores. It's not an RPG! You've played it, so you should know that! I see, I guess I just hadn't connected it to the internet for Wandering Adventures then. It's an RPG wannabe, more like. I'm talking about leveling up, buying new gear, having roles, etc. An RPG doesn't have to be turn-based. Should I call it an action-RPG? It's a boss rush excerpt from an action-platformer. It's like, say, calling Double Dragon an RPG. You can do things to unlock new moves and increase your damage output, and you can play as different dudes when beating people up. But the level of non-combat elements just aren't there for an RPG. The statistics are superficial variables.